Give your living room a modern upgrade with this contemporary pink velvet Jackson two-piece sectional sofa. Its channel tufting design adds texture to its plush pink velvet upholstery, creating a resting piece that is pleasing to the senses. 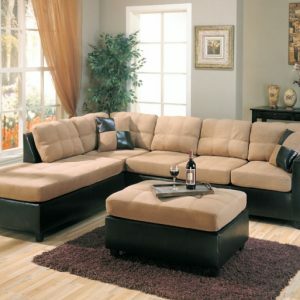 Its lengthy, curved design provides ample space for you to stretch out, or cuddle up with your family. Complete sets of gold and chrome legs are included so you can customize this sectional to suit your existing décor.